(Newser) – One last comeback complete. One last medal. Five days after crashing in super-G, Lindsey Vonn bounced back to win the bronze medal in the world championship downhill in Are, Sweden on Sunday in the final race of her career. "I laid it all on the line. That's all I wanted to do today," Vonn said. "I have to admit I was a little bit nervous, probably the most nervous I've ever been in my life. I wanted to finish strong so badly." It's a medal that brings Vonn full circle: the American's two silvers at the 2007 worlds on the same course in Are were the first two major championship medals of her career, reports the AP. When Vonn crossed the finish line she had a big smile on her face, waved and bowed to the crowd. 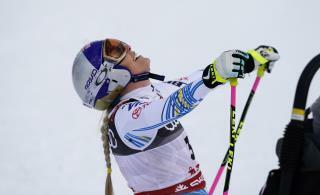 "I'm just happy I made it to the finish and I came down in the lead, which was nice for my last race," Vonn said. "I'm also safe. I made it down safely." As soon as she exited the finish area, Vonn embraced Swedish great Ingemar Stenmark, the only skier to win more World Cup races than Vonn—86 to 82. "I'm happy that I could finish strong," Vonn said. "I soaked it all in. I waved to the crowd one last time. Ingemar being in the finish area was literally the best thing that's ever happened in my life." Vonn becomes the first female skier to win medals at six different world championships. It's also her fifth downhill medal at worlds, matching the record established by Annemarie Moser-Proell and Christel Cranz. At 34 years and 115 days old, Vonn also became the oldest woman to win a medal at a worlds, eclipsing the record set by Veronika Velez-Zuzulova in the mixed team event in 2017 at 32 and 214 days. "Thankfully right before I went, the sun came out," Vonn said. "I was like, this is it. This is my day. I just charged. It was a perfect day for downhill." Good for you, lovely woman ! !